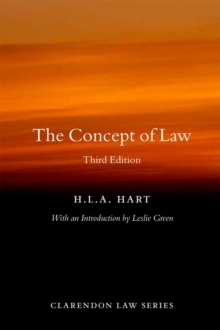 Providing an introduction to law in modern society, D.
J. Galligan considers how legal theory, and particularly H.
L. A Hart's The Concept of Law, has developed the idea of law as a highly developed social system, which has a distinctive character and structure, and which shapes and influences people's behaviour. The concept of law as a distinct social phenomenon is examined through reference to, and analysis of, the work of prominent legal and social theorists, in particular M.
Weber, E. Durkheim, and N. Luhmann.  Galligan's approach is guided by two main ideas: that the law is a social formation with its own character and features, and that at the same time it interacts with, and is affected by, other aspects of society. 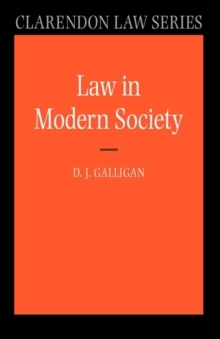 In analysing these two ideas, Galligan develops a general framework for law andsociety within which he considers various aspects including: the nature of social rules and the concept of law as a system of rules; whether law has particular social functions and how legal orders run in parallel; the place of coercion; the characteristic form of modern law and the social conditionsthat support it; implementation and compliance; and what happens when laws are used to change society. 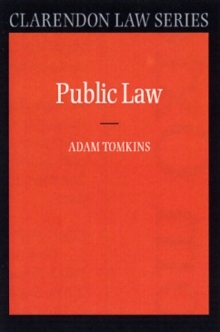 Law in Modern Society encourages legal scholars to consider the law as an expression of social relations, examining the connections and tensions between the positive law of modern society and the spontaneous relations they often try to direct or change.